Please click here to view our fees list. 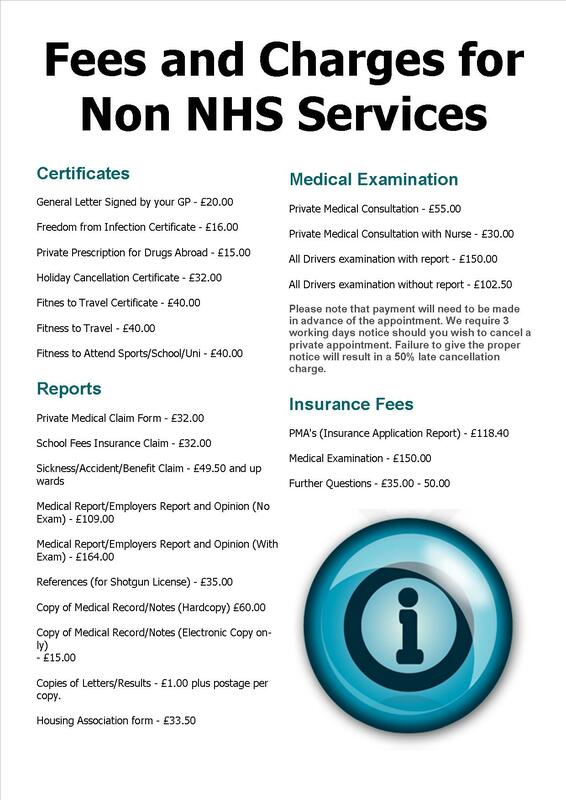 This list is comprehensive and based upon a range of services that the practice offers, however the practice reserves the right to charge a fee for any services which are not provided free of charge within our NHS contract or for patients who are not entitled to NHS care. Please note that full payment by cash or cheque is required in advance of all non-NHS services. Why would there be a fee for a letter that I have requested? Doctors are involved in a whole range of non-medical work, largely on the basis that they occupy a position of trust and are in a position to verify the accuracy of information. When a GP signs a certificate, completes a report or dictates a letter, it is their professional duty to check that information is accurate and correct. Often this will mean that the GP has to check the patients entire Medical Record some of which is held on computer, but older information may require them to go through your paper notes manually, even a simple letter may take over an hour to check, dictate and generate.